The idea that light-skinned minorities are given more privilege than their darker-skinned peers, is a centuries-old concept that many insiders say remains pervasive in the entertainment industry. 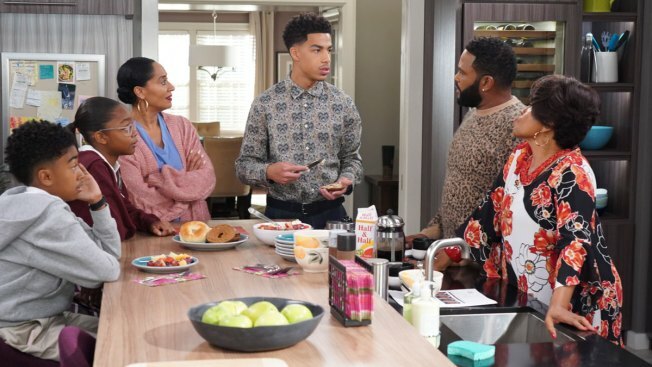 This image released by ABC shows, from left, Miles Brown, Marsai Martin, Tracee Ellis Ross, Marcus Scribner, Anthony Anderson and Jenifer Lewis in a scene from "black-ish." In the episode airing on Tuesday, Jan. 15, Dre, played by Anthony Anderson, and Bow, played by Ross, are furious after Diane, played by Martin, isn't lit properly in her class photo. The episode outlines the history of colorism in depth while injecting some humor. The breakthrough representation of minorities in Hollywood blockbusters has ignited a frequently overlooked discussion about whether prejudice isn't just about the color of a person's skin, but the shade. "Colorism," the idea that light-skinned minorities are given more privilege than their darker-skinned peers, is a centuries-old concept that many insiders say remains pervasive in the entertainment industry. The instant reckoning of social media has brought prominence to the issue and on Tuesday the ABC sitcom "black-ish," known for not shying from heavier topics, confronted it. In the episode "Black Like Us," parents Dre and Bow (played by Anthony Anderson and Tracee Ellis Ross) are appalled when they see that daughter Diane (Marsai Martin) appears darker in her poorly lit classroom photo. Their outrage sparks a tense conversation within the family. "There is a light-skinned privilege that I never really wanted to admit I felt or experienced. I sort of grew up 'Oh, we're all black. We all experience the same struggle,'" he said. More often when movies and television shows ignite conversations about colorism, it's unintentional. When images from "Ralph Breaks the Internet" came out last year, it appeared Princess Tiana, Disney's first black princess, had a lighter complexion and sharper features. Anika Noni Rose, who voices Tiana, met with animators and spoke about how important it was that dark-skinned girls see themselves represented. The studio also consulted the civil rights group Color of Change. "They had to spend some real money to actually fix this. They recognized the problem, they listened and they worked to change it," said Color of Change executive director Rashad Robinson. The movie "Crazy Rich Asians" left some Asian-Americans disappointed by a lack of brown or dark-skinned actors. Meanwhile, "Roma" director Alfonso Cuaron received praise for casting Yalitza Aparicio in the lead role of an indigenous maid. The character is more at the forefront than her lighter-skinned Mexican employer. That is a strategy that "black-ish" co-showrunner Smith also agrees with.